Lighting in the kitchen has become important to modern homeowners looking to remodel and improve their existing kitchen lighting along with other remodeling ideas. If you have an older home or just insufficient lighting it can be kind of embarrassing to have guests over mostly sitting in the dark on an underlit island. The kitchen is no longer just the place where food is cooked and brought out to guests in the dining area, with improved island seating and kitchen lighting, the kitchen is now a primary area for family and guests to hang out. With breakfast bars and other design ideas bringing everyone closer together, it can be a worthwhile investment if you like to have your kids or friends spend time with you while you are preparing food. Kitchens are the place where everyone likes to meet, children complete their homework, mum and dad chat over a glass of wine even the pets like to sit nearby. 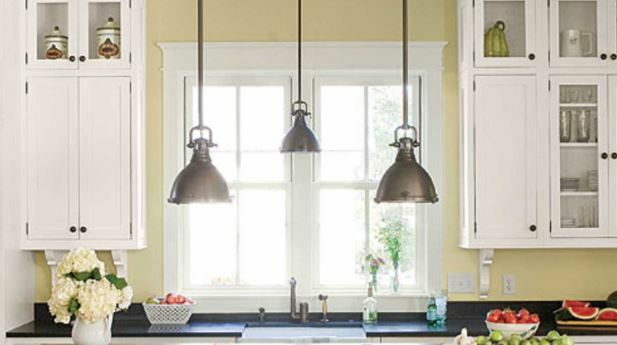 If you’re thinking about improving the lighting in your kitchen there are three types of kitchen lighting to consider. The general lighting used for the whole kitchen is called the ambient lighting which is what allows you to see everything. This can usually be accomplished with one larger center light hanging down from the middle of the kitchen or over your island. More focused lighting to help with your cooking and other kitchen tasks is called task lighting. These lights are typically smaller and go in specific areas of the kitchen like the sink or food preparation areas. Accent lights are what you use to feature your kitchen cabinets, alcoves and other working areas that you want to stand out. Examples are under cabinet lighting, island lighting and pendant lights. We have many customers ask us about upgraded kitchen lighting after they have already completed a significant kitchen remodel. If you are interested in improving your kitchen lighting and look then contact us for a free quote and we would be happy to explore your options with you.